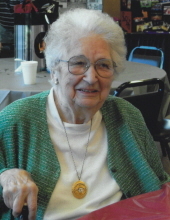 Elaine Thompson, age 97, formerly of Radcliffe, IA, passed away on Friday, April 5, 2019 at Hubbard Care Center in Hubbard, IA. Elaine Ida Thompson was born to Fred and Elsie (Dubberke) Doering on June 19, 1921 at home on the Doering centennial farm site south of Hubbard. She was the oldest of five children born to this union. Elaine attended Grant #4 country school and graduated the eighth grade. After graduation she continued to work on the family farm and for various families around the Hubbard area doing family and farm chores. Elaine was united in marriage to Leonard Thompson on September 14, 1948. The couple moved to Ames where Leonard worked as a barber and Elaine worked in a laundry. They resided in Ames for five years and moved to Radcliffe in 1952 where they purchased the barber business from Leonard’s father. She resided in Radcliffe until July 5, 2016 when she was moved to the Hubbard Care Center due to health issues. She remained there until April 5, 2019 when the Lord called her home. Elaine was a lifelong member of St. John’s Lutheran Church in Hubbard, baptized on July 10, 1921, confirmed April 14, 1935, married September 14, 1948 and her celebration of life April 11, 2019 all took place at St. John’s. Elaine taught Sunday School for many years, was involved in Missions Circle and many other church organizations. She enjoyed quilting through the church and when she could no longer quilt she would thread the needles for the other quilters. Elaine’s faith and church were very important to her. Elaine’s primary career was that of a homemaker during their life in Radcliffe. Leonard and Elaine were blessed with three boys, Robert, David and Paul. After the boys were grown Elaine went to work for Donnelley Marketing in Nevada until retirement. Elaine was a long-time member of the Legion Auxiliary. Those left to cherish Elaine’s memories are three sons, Robert and his wife Patty of Englewood, Florida, David of Radcliffe and Paul and his wife Deb of Conrad; five grandchildren; two step-grandchildren; two great grandchildren; five step great grandchildren; sister Betty (Howard) Linn of Iowa Falls, brothers Wilbert (Janet) Doering of Webster City, Arvene (Nancy) Doering of Hubbard; three sisters-in-law, Lue Doering of Iowa Falls, Arlene Reed of Eldora, Jeanette Harless of Eldora; along with many other relatives and friends. Elaine was preceded in death by her parents Fred and Elsie Doering, husband Leonard, brother Harry Doering, brothers-in-law Ralph Reed and Don Harless and nephews Ron Doering, Roger Reed and Les Reed. Elaine will always be remembered as a shining example of putting others needs ahead of hers and being extremely thankful of what God had given her. May she rejoice in her new home. Memorial contributions may be directed to the family for a memorial fund to be established. To send flowers or a remembrance gift to the family of Elaine Thompson, please visit our Tribute Store. "Email Address" would like to share the life celebration of Elaine Thompson. Click on the "link" to go to share a favorite memory or leave a condolence message for the family.